The Dell 7559 Laptop is yet another feather in the hat of the impressive Dell Laptop Series. In case you are looking for something that draws the perfect balance between entertainment and productivity, then this portable device might just be it. Sporting an elegant black finish, it looks sleek and is an instant eye candy. Featuring a 15.6inch UHD Truelife LED backlit display that presents maximum resolutions of 3840 x 2160 pixels, the content on your screen comes to life for an immersive visual experience. The Dell 7559 Laptop is armed with a 6th Generation Intel Core i7 6700HQ processor, which ensures that this laptop works smoothly and without any glitches. Boasting of a 16GB RAM, running multiple applications at once does not slow down the device but instead gives you remarkable multitasking abilities. Working under the hood is innovative Windows 10 operating system, that offers features and functions like Cortana voice assistant, Microsoft Edge browser, TaskView, a revamped Start Menu, and lots more. Armed with a huge 1TB Hybrid HDD alongside a remarkable 128GB SSD, this portable device eliminates the need to carry external storage devices. You can store all your videos, movies, ebooks, and other such documents on the Dell 7559 Laptop. Connect to the Internet through available wireless networks, thanks to the WiFi connectivity that this portable system provides. With a rechargeable, 74WHr, 6 cell battery, you do not need to worry about this laptop giving up on you in the middle of an important task. Additionally, the Dell 7559 Laptop features two cooling fans, three exhausts, and large vents to keep your system and palm rest cool. The Dell 7559 Laptop is one of the best Dell laptops available in the market. This laptop fits a 15.6inch screen with a resolution of 3840 x 2160 pixels that makes watching things on this system a pleasant experience. Employing the UHD technology on its Truelife LED backlit touch display, this device ensures that whether you are watching movies, reading or browsing the Internet, the content on your screen is bright, vivid, and true to life. The Dell 7559 Laptop specs have garnered some fantastic reviews on major tech websites. This laptop features the Windows 10 operating system, which has been designed keeping your needs in mind. This OS features a Microsoft Edge Browser, Cortana, and live tiles that ensure you're updated with everything that matters to you. The Dell 7559 Laptop reviews all talk about its mind blowing performance. This portable computing device features the 6th Generation Intel Core i7 6700HQ processor that enables this system to function without any glitches. It also boasts of a 16GB RAM that facilitates multitasking without draining its powerful battery. 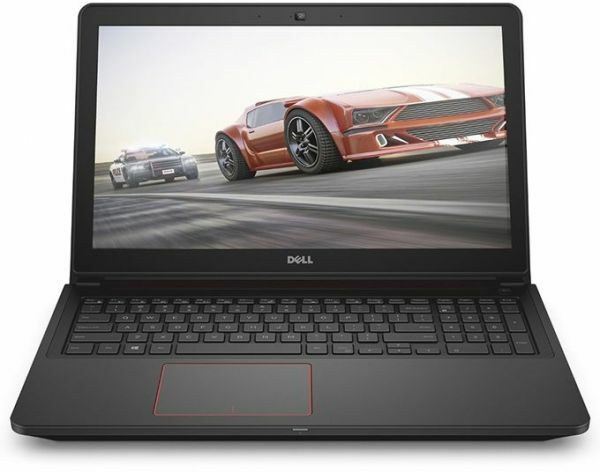 In addition to this, the Dell 7559 Laptop includes the NVIDIA GeForce GTX 960M graphics card with a 4GB GDDR5 discrete memory that enables you to play heavy games and run high end software without any lag. This device boasts of a 1TB HDD along with a 128GB SSD storage capacity to ensure there is enough space to store all your music, images, ebooks, and various other documents in just one place. The Dell 7559 Laptop lets you connect to the fastest Internet around thanks to its WiFi connectivity. This laptop features three USB ports and an HDMI port, allowing you to quickly transfer all your data. Additionally, this laptop also offers Bluetooth support to give you access to multiple wireless devices.